As we roll into July and the dog days of summer, fly sheets to keep our horses comfortable and happy really become a necessity. But not all fly sheets are created equal. When you’re out shopping, be sure to keep in mind three things: fabric strength, weight, and how much of the horse you’d like covered. Consider how gentle or rough your horse is on clothing or if he’s even worn clothing before. First timers (& not necessarily just young horses) will typically be very curious about this new toy mom’s purchased for them: they pull at the fabric, try to roll it off, ask a neighbor to help get it off and more! If clothing is not new to the horse, strength of fabric still needs to be considered: can the horse rub on a tree? Does he have a shack or similar objects in proximity that the sheet might get hung up on as he moves around? Perhaps a nosy neighbor who is curious & can do damage to a sheet that isn’t even his? For the tough at heart, try the Rambo Protector, the Kensington Protective Sheet, or the Weatherbeeta Dura Mesh Detach A Neck, which includes a free matching fly mask! If you’re not sure it’s necessary to choose one with some extra durability, the Turtle Neck Fly Away fabric is a quality mono-filament nylon. The Weatherbeeta Airflow Mesh sheets are a perennial favorite and if cost is a concern, the Saxon Soft Mesh sheet is a bit more durable than the Basic Saxon. For the very easy keeper who never puts the blankie in her mouth, would never consider tugging on a chest strap, and who has already told that naughty neighbor to “stay away!”, we love the lightweight, lovely drape of the Big D mesh fly sheet with closed front which has a great tapered cut, fitting closely at hip & shoulder. Or consider the Centaur Super Fly sheet, which offers a bigger boxier Euro cut, providing more room at the shoulders and a more forward neck. And new to Mary’s this season is the Action fly sheet by Eous, which has a matching hood available (purchase separately) for extra coverage. For the horse very bothered by flies, mosquitoes, and more, the Amigo Bug Buster and the Weatherbeeta Supafly Detach A Neck incorporate insect repellant technology right in the fabric with neck & belly coverage included! Or consider adding this is very cool new belly guard from Cashel to an existing fly sheet (don’t worry- your gelding can urinate through the light mesh fabric) for extra protection. And finally, don’t forget your buddy’s legs! 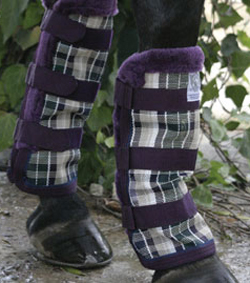 Put fly leg wraps right next to the fly mask on your shopping list and give one of these a try: Kensington, with soft fleece to protect, available in great dirt hiding plaids; Cashel with awesome darts for exquisite fit; Fly Wraps ™, which come in a set of 4 and allow great air circulation; and new this year – Rambo Fly Boots, which are SO soft yet rugged at the same time. 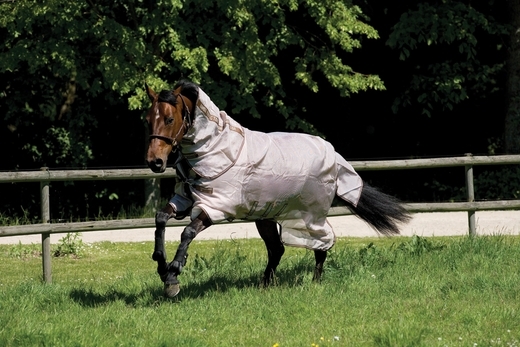 Once you find the perfect fit for you and your horse, you’ll never spend another summer without fly protection again!